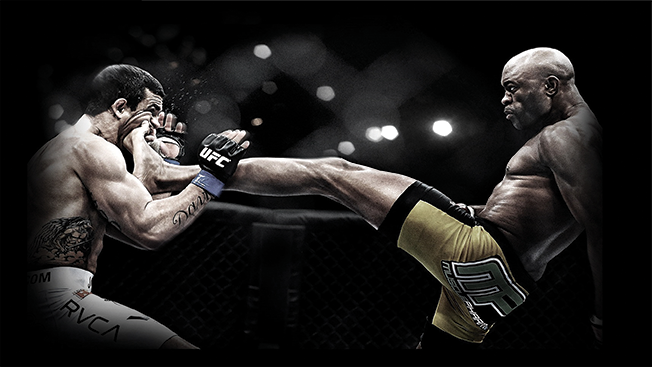 The mixed martial arts franchise Ultimate Fighting Championship has never been in such fighting form. Since it was founded in 1993, it has become an established part of the sports mainstream (it's now bigger than baseball), as adrenaline-hungry fans around the world have flocked to its signature blend of violence, athleticism and entertainment. Its purchase this past July by powerhouse Hollywood talent agency WME | IMG for $4 billion only supercharged its winning streak. With a global fan base of 269 million, brand partners in Anheuser-Busch InBev and Harley-Davidson, and superstars like Conor McGregor and Ronda Rousey, there has been but one bump in the path of UFC's ascendancy: New York. In a twist on the famous line about the city, UFC had made it everywhere—except in the country's biggest market where the sport had been banned. In March, state lawmakers voted to legalize MMA in the state, giving UFC entree to New York's lucrative advertising market and access to one of the hottest venues in sports, Madison Square Garden, where the UFC will host its first New York fight on Nov. 12. New York was, in fact, the last holdout—UFC now has a presence in all 50 states. "My compliments to the state of New York—welcome to the 21st century, and better late to the party than never," says Dino Bernacchi, U.S. marketing director for Harley-Davidson, which has been a UFC sponsor since 2007. "It's a big deal and an incredible market for us, and it can unlock more opportunities to get the brand out there." To UFC president Dana White, who was recognized in 2014 as an Adweek Brand Genius for his work in building the franchise, entering New York is huge for UFC. "It's the media capital of the world, so it's very important," he says. "Our presence in New York creates a lot more awareness for agencies and brands." The New York decision further legitimizes UFC, which has battled with regulators throughout its history as MMA is more difficult to regulate than traditional team sports, notes Matt Powell, sports analyst at NPD Group. "New York state coming in was a stamp of approval that they have their act together and it's a clean sport," he says. "It's a very meaningful decision for them [and] certainly getting a lot of attention, and brands are figuring out how to leverage it." "Many people within the sport looked at New York as the pantheon of the fight world—so many of the great fights in history happened in New York, and all of the big leagues are headquartered there," adds Kelsey Philpott, senior director of global sports and entertainment consulting at GMR Marketing. 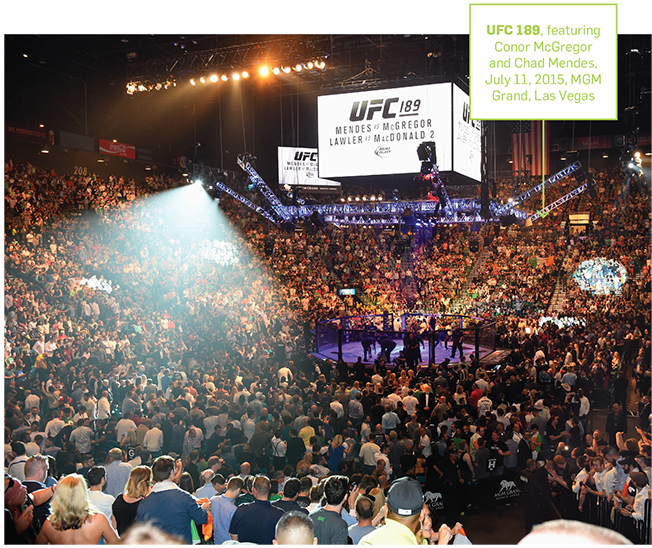 UFC has built itself up as a multifaceted entertainment powerhouse for thrill-seeking fans. It's a major draw for Las Vegas gambling, has spawned a chain of 135 gyms around the world and last year brought in $600 million in revenue. It reaches 1.1 billion TV households worldwide via broadcasts on Fox and Fox Sports 1 in the U.S. and by way of pay-per-view in 156 countries. Its fights are, in fact, the world's largest pay-per-view events, producing 42 telecasts every year. UFC pulls in more total fans than Major League Baseball (223 million) and the National Hockey League (199 million), according to Nielsen. "If you look at where it was 15 or 16 years ago, UFC has come a long way," White says. "We're on network TV now, and women compete in the sport. It's more mainstream, and it reaches more people than you realize. It's obviously a combat sport, but golf isn't for everyone either. It's a tough sport, one that brands like Harley-Davidson want to associate with."